After landing in Taipei, I walked up to the Taipei Fine Arts Museum, where I saw lots of really interesting calligraphy done during the Japanese occupation. From there, I made a trip to BeiTou to soak in the hot springs. I had a few other destinations in mind, notably the handicraft museum up in the hills. From the Xin Bei Tou station, I walked uphill for about 30 minutes only to find a sign noting that the museum was closed for a year for renevations. Argh. Evidently, this was written in Chinese on some of the road signs that led up to the museum, but it escaped my notice. Once up there, I walked next door to Shann Garden, where I was completely ignored by all staff members while I stood at the front desk waiting for someone to say something to me. I left, annoyed, and went to the little tea house attached, where I met a much nicer and talkative staff member. Had I not been by myself and had other plans, I would have stayed and had tea in this nice little tea house. Skip the restaurant and "spa" and go to the tea house instead. A walk back down toward the train station led me by a few hot spring resorts. I only like the private, no swimsuit kind, so that limited my choices somewhat. I chose Spring City Resort, a resort that included an "afternoon tea" with their one hour soak for NT$780 , which seemed like a decent price for hot springs near Taipei. I was actually really pleased when the afternoon tea was a delicious roasted chicken meal with soup, a great salad and dessert! The bath room was nice, with the one exception of having no windows. 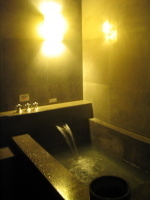 Other than that, though, a really reasonable and enjoyable hot spring experience. Of course, all the walking around put me kind of late, so I missed the aboriginal Ketagalan Museum. 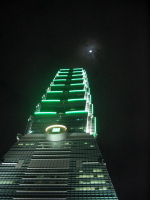 Once back in Taipei, I decided to head to Page One books, in Taipei 101. Supposedly, they have an excellent English book selection. While I would say it was indeed pretty good, I didn't find any of the books I was looking for. The staff didn't seem very knowledgeable either. When I asked about local Taiwanese literature translated into English--of which there are a few titles--they pointed me to a section on classical Chinese literature. Huh? Whatever. I picked up some good Taiwanese history books, though, which made me quite happy. A big moon overhead, I left 101 to search for The Tavern, which I have heard about. I had a GREAT Bangers and Mash for dinner. All in all, things went well in Taipei. I got done all the things that are much harder to do in Kaohsiung--cultural museums, English books, great Western food. Interestingly, while my Chinese pronunciation has never caused problems in Kaohsiung, I was misunderstood twice while in Taipei. Once by a older taxi driver whose Chinese was heavily inflected by Taiwanese. He confused Min Sheng and Min Cuan road, and started to take me to the wrong place. The second time I had troubles would be on the trip back to Kaohsiung and would have a bit more inconvenient result. Aw. It makes me wonder if there were any signs there for the tourist which are written in English. Were there any? Maybe that's why you've missed the signs. Well anyway, it sounds like that tea house has some awesome service. How would you rate it in a scale of 1 to 10, with 10 being the highest?